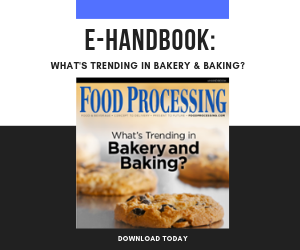 From robotics and extrusion to data analytics and new learning techniques, technical advancements are adding value in North American bakeries. Whether it’s the carrot of new-product opportunities or the stick of regulatory and customer demands, North American bakers are investing in production systems that deliver both greater flexibility and increased productivity. Coextruded snacks and cereals typify the kinds of products that once were considered exotic and now are gaining a growing audience. An example is Lion cereal from Nestle. A whole-grain, vitamin-fortified, premium product, Lion has a core of caramel paste surrounded by a crisp wafer enrobed in milk chocolate. Produced in a plant in France and distributed throughout Europe, North America and elsewhere, Lion is made possible by twin-screw extruders that output a continuous rope that is then enrobed, cut and crimped into bite-sized dimensions. Twin-screw technology dates to the mid-20th Century and is used extensively in plastics and other industries, but cost and complexity relegated it to incidental use in food production until more recent years. Cost remains a barrier, and single-screw extruders still dominate in snacks and other foods, but the machines’ versatility and consistency in producing complex products at high volumes are prompting many food companies to give the technology serious consideration. The diversity of interest in twin-screw extrusion is illustrated in the mix of corporate executives, entrepreneurs, operations and R&D personnel who attend Clextrol USA’s annual Extrusion Discovery Course at its Tampa, Fla., pilot plant each year (this year’s program runs April 10-12). Manufacturers of premium snacks, meat analogs and pet foods are gravitating to twin-screw extrusion. Clextral hosts a training workshop at its Tampa, Fla., pilot plant April 10-12. “The fear factor has disappeared,” says Gilles Maller, vice president-sales and international (www.clextral.com). “People are more and more comfortable with the technology.” Many are considering replacing multiple single-screw machines with one twin-screw extruder that can produce a more diverse range of products, including super-premium and indulgent foods. Clextral modified its earliest extruders for food applications in the 1970s. The latest are the Evolum series, machines with 30-40 percent higher capacities than the previous generation. They also reflect the higher sanitary standards now applied to food manufacturing, as well as the latest technical advances. “The need for hygienic design has become more intense in the past 5-6 years,” says Maller. Stainless steel construction and component accessibility for cleaning and sanitizing were integral to the redesign. “It wasn’t a barrier before, but if we did not have a hygienic design today, that would be a big barrier,” he notes. The re-engineered extruder incorporates advanced thermal controls that help enhance the consistency, structure and mouthfeel of products. High sheer is a distinguishing characteristic of extrusion, along with pressure and heat. Maintaining consistency is critical in creating light, finely textured products. PID loops typically are used to monitor and adjust temperature in the barrel. The new machines rely on sensors and software that factors in temperatures in the zones, each with its own heating and cooling system, to understand the overall impact. Heat transfer is optimized “not area by area, but what is happening everywhere,” Maller explains. Less fluctuation from setpoint is provided; whereas variations of 2-3°C occurred before, deviations of plus or minus 1°C is the new norm. Machine intelligence also is enhanced, with the extruder “learning” how best to balance pressure, heat and sheer for each recipe, based on prior outcomes. Improvements in materials of construction for the barrel and screws are part of what Clextral calls Total Preventive Maintenance. Machine wear leads to gaps between the screws and barrel over time. The metallurgy in the new machines helps hold tolerances for more than 20,000 hours of run time, five times longer than the prior generation of extruders. Total Preventive Maintenance also guides operators through daily routines that free maintenance technicians for more value-added activities. And relieving skilled technicians of mundane tasks that take time from more value-added projects and contribute to on-the-job drudgery is a priority. Workforce availability is a growing problem in baking. A study by the American Bakers Assn. suggests 93 percent of baking companies rate finding talent to be a challenge, with more than one-third rating it a significant challenge. Higher pay rates are the go-to solution for many firms, but a better way to attract and retain qualified maintenance workers is to equip them with tools that reduce the stress of putting out fires, suggests Robert Thiel, project manager with Somax Inc. (www.somax.com), an Atlanta-area CMMS vendor. He dismisses software based on a SQL server as an obsolete approach that is “going to die in five years.” A cloud-based solution, Thiel maintains, with sensors that monitor machine temperatures and alert technicians to temperature spikes on a tablet or other mobile device is much cheaper and more effective in avoiding unscheduled downtime. Thiel recalls the bakery maintenance manager he recently met who had worked 12 hours a day, every day, from Memorial Day to October. “His bank account was fat,” he allows, but prospects for long-term employment were dim. “If maintenance men are supported with a good parts room and a mobile CMMS that lets them focus on PMs, they’re not going to be tied to that facility on weekends,” Thiel points out. Oven zones that deliver top and bottom radiant and convection heat and steam injection and extraction make Mecatherm’s FTA oven one of the most versatile systems available. Bakers’ embrace of technology’s ability to improve plant performance and make work more satisfying has been somewhat tepid. An example is the e-connect software suite from Mecatherm (www.mecatherm.fr), a French OEM of integrated baking lines. New equipment from suppliers like Mecatherm often comes with an IP address and sensors needed for remote monitoring. If bakers enable that capability, they can leverage capabilities like e-connect pack’s maintenance, traceability and energy and exhaust monitoring modules. After rolling out the internet-enabled system in Europe in 2016, Mecatherm deployed e-connect at two North American bakeries last spring. To date, they are the only systems operating on the continent. “Today’s North American customers are not ready yet” to shift from scheduled maintenance to predictive maintenance, shrugs Franck Ellenbogen, sales manager for Mecatherm North America in Atlanta. Plans to augment the maintenance module with cloud-based data analytics may improve the value proposition sufficiently to win early adopters. If bakers are skeptical about remote machine monitoring, the same can’t be said about adaptable equipment that can produce a broad range of products. Rack ovens designed more for restaurants than commercial bakers are featuring multi-functionality. An example is Baxter Manufacturing’s VersaOven, a combination rotisserie and convection oven with an on-board CIP system that also delivers 100 percent saturated steam. For larger end-users, Mecatherm’s FTA oven provides multiple means of heat transfer in each oven zone. Top and bottom radiant heat, top and bottom convection heating, steam injection and steam extraction can be controlled in each zone to produce a broad range of baking profiles. The system has baked at least 20 distinct products, everything from pies to croissants to hearth breads. That degree of flexibility comes at a cost, and FTA ovens command a big premium over conventional lines, including high-throughput units. The same could be said of machines with robotic motion, but the ability to create distinctive products is driving adoption. More than 100,000 robots were added to U.S. manufacturing in the last five years. “It’s not as strong in baking,” Ellenbogen allows, “but to get production flexibility, robotics is the answer.” Mechanical scorers can leave a straight-line score on dough, but the market is demanding swirls and other distinctive cuts. To meet the demand, Mecatherm introduced a robotic scoring machine. Industrial baking was one of the manufacturing sectors identified by Soft Robotics Inc. (www.softroboticsinc.com), Cambridge, Mass., as a prime opportunity for its end-of-arm tools when it launched in 2016. That assessment proved correct, according to CEO Carl Vause. With grippers that are pneumatically inflated to 1-13 psi at 3-4 cycles per second, the tool initially targeted delicate products like donuts. But applications have expanded to frozen dough and other bakery products because of the gripper’s ability to pick and place objects that are 10 percent larger or smaller than the set-point size. “For traditional robotics, that’s a show stopper,” says Vause. “You see plenty of robotics automation in bakeries, but you also see opportunities for more,” observes Jeff Dearduff, corporate director-baking and snack at the Austin Co. (www.theaustin.com), a Cleveland-based architectural engineering firm. Secondary packaging and systems for pan- and dough-handling are the most common applications, but the range of products and package types have limited product-handling opportunities, he suggests, along with the availability of technical support to maintain robots. “Labor’s becoming the real challenge,” Dearduff continues, “not only in numbers but in the quality of people you can draw.” To indoctrinate raw recruits who are disinclined toward training manuals and traditional approaches, AIB International recently partnered with Alchemy Systems for interactive live and remote training courses. “Nobody wants to read anywhere,” states Raj Shah, chief strategy officer at Austin, Texas-based Alchemy (www.alchemysystems.com). The nine baking courses on topics such as the bread manufacturing process and bread troubleshooting were developed by AIB several years ago. Alchemy is applying the latest educational engagement approaches to make them more effective. But engineers and other high-skill professionals always have been in short supply, with “the best guy you had called the chief engineer, but he really wasn’t an engineer,” Dearduff reflects. If bakeries are to realize the full potential of robotics and other advanced automation, remote machine monitoring will have to be part of the mix. “Companies have to find a way to get over the security concerns,” he allows. Once they do, increased efficiency and uptime will follow. “Continuous mixing equipment is probably one of the biggest disruptors,” Dearduff concludes. Counter to other baking advances, continuous mixers are somewhat less flexible than the units they replace, but the efficiency gains offset that loss. PSSSST! Want more? Visit us at Smart Industry to find expert insight on digital manufacturing and the digital transformation of industry. Finish reading this article and, when you're ready, click here to access Smart Industry.